I’m devoting this week’s entry to an L.A.-based ARG that just wrapped up this past Sunday, the Miracle Mile Paradox. The experience was produced by Transmedia L.A., a local group that hosts monthly meetups and ad hoc events to bring together Los Angeles-based transmedia enthusiasts. If you’re in L.A. and you’re into this stuff, I strongly suggest you sign up for the free meetup group and come to a meeting! Miracle Mile Paradox is now officially over, so I don’t feel bad posting spoilers here, but if you want to try to piece the whole story together after the fact before reading any further, this piece on ARGnet is a good place to start. MMP kicked off back in March when rare antiquities collector Rex Higgs stumbled across a set of blueprints for a mysterious device called the Time Switch. 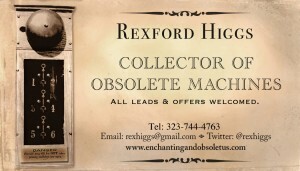 Rex promptly set up a Kickstarter to fund his construction of the machine, the proceeds of which were used by Transmedia L.A. to fund the ARG itself. 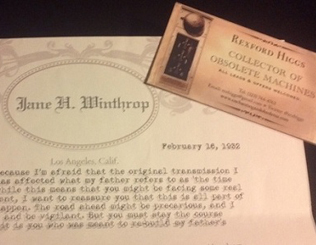 After successfully assembling the Time Switch, the device began receiving transmissions from a woman named Jane Winthrop… messages from 1932. Shortly thereafter, Rex received a cease and desist letter from a company called AIC, which claimed to be the sole patent holder for the Time Switch. It soon became clear that AIC was using said technology for their own nefarious purposes, and that they would quash anyone who got in their way. The ARG’s creators really made the stretch of Wilshire Blvd known as Miracle Mile a character unto itself, incorporating the Mile’s rich history into the story, and involving more than 30 local businesses in the unfolding plot. After receiving repeated death threats from AIC, Rex was forced to hide his Time Switch from prying AIC eyes and go on the run, but not before seeding clues in several dozen Miracle Mile locations for his in-game friends and local participants to find. Clues like his business card, which fans could only retrieve by talking to a real-world employee of one of the above-mentioned businesses. Rex’s card entreated his would-be allies to call him ASAP. After calling the number on the card, players began to receive text messages leading them to other sites, where they could uncover information like the secret location of the Time Switch and the code to get inside. Players knew they were on the right track when they saw this sticker in a store window. Since Rex was in the wind, he was forced to rely on the kindness of strangers to go to the Time Switch location at certain prescribed times to receive further transmissions from the past. Jane’s transmissions were garbled however, which fans attributed to AIC interference, and on top of that, her messages were encoded. Cleaning up the garbled messages and cracking Jane’s code were just a few of the ways that non-local fans could get into the action. I wish I’d had the opportunity to play through the entire ARG from the beginning, but the lion’s share of it overlapped with the release of my transmedia series “Fury of Solace,” so I was only able to jump in for the tail end. That said, I was excited to be able to attend the final event this past Sunday, where about a dozen loyal players got the opportunity to see Rex and the Time Switch in person, and help the eccentric collector destroy the Time Switch and hammer the last nail in the coffin of the evil AIC Corporation. Rex and the Time Switch. Now, I was bound to be a fan of this project: I’m a sucker for a good time-travel story, and “fighting an evil corporation” is probably one of the most recurrent themes in my own writing, up to and including “Fury of Solace.” And the more I delve into Miracle Mile Paradox, the more I’m convinced that me and the MMP team are on the same wavelength. Not only are both of our transmedia projects centered around fans hacking into the accounts of evil mega-corporations, but we each, completely independently of one another, chose the same building, 5455 Wilshire Blvd., to be the stand-in for our respective evil company’s corporate headquarters! Not only that, the live anti-AIC protest that Transmedia L.A. staged with characters and fans alike is strikingly similar to our original plan for the anti-Mason International protest that Uroboros spearheads in “Fury of Solace.” We, too, wanted to stage our protest live and invite fans to participate, but important story points were scheduled to take place at our event as well, and we ultimately realized we didn’t have the infrastructure to stage a live event with fans AND get the footage we needed for the episode, so we had no choice but to drop the ARG component of that particular event. With about 30 characters from soup to nuts, and a transmedia trail that included character blogs, websites, Twitter accounts, Facebook pages, LinedIn profiles, Pinterest boards, Foursquare check-ins, and real-world interactive events, Miracle Mile Paradox was nothing if not an ambitious project. Once the story wrapped up and we were all officially “out of game,” I had the opportunity to chat with one of the project’s brainchilds, April Arrglington, who was kind enough to give be a behind-the-scenes glimpse of the project. MMP was lucky enough to have a team of writers, each of whom handled the social media presence for two or three characters, maximum. As I mentioned in an earlier post, we experimented with that kind of character delegation for “Fury of Solace” when I assigned the bulk of the Uroboros story to one particular writing-team, and even that little taste made me realize that if you have the resources at your disposal, that’s the only way to go. For one thing, divvying up the characters amongst different writers guarantees that they’ll each have distinct voices. For another, and I can say this from experience, trying to manage 20 different character Twitter accounts single-handedly is a surefire way to develop Multiple Twitter Personality Disorder! If I hadn’t been so busy releasing and managing “Fury of Solace,” I probably would have taken part in MMP from the beginning. As it was, I was forced to try to reconstruct it at the very end. One thing that does seem to be missing is an authoritative recap of everything that’s come before, though admittedly there are so many disparate threads that chronicling it while the game was in progress would have been nothing short of a herculean task. Plus, I assume the creators didn’t want to deprive new players of the joy of digging through all of this stuff themselves (though coming into it at the tail end was a bit overwhelming even to an ARG veteran like myself). But MMP’s rabid fans did do their best to bring new players up to speed, posting recaps and speculations on the in-game message boards, fan-made wikis and Unfiction threads. Unfiction is actually a great resource for discovering all manner of ARG’s, follow the link and check it out if you haven’t already. But if you’re going to post there yourself, make sure you read their rules carefully; they’re pretty strict about distinguishing between in-game and out-of-game posts, and about the guidelines when it comes to ARG creators posting trailheads to their own projects. For people like me who want to get a bigger picture of the entire MMP event, exactly what went on behind the scenes and just how engaged the audience truly was, April is preparing a detailed case study of the entire experience, which she’ll be presenting at this year’s Storyworld Conference. This year, Storyworld is being held in Los Angeles, from October 15th through 17th. I’ll be attending, and I highly recommend that other transmedia enthusiasts do the same, if you can scrape together the cash. That’s it for this week, folks. See you next Wednesday, same transmedia time, same transmedia channel!